Product prices and availability are accurate as of 2019-04-08 01:01:21 EDT and are subject to change. Any price and availability information displayed on http://www.amazon.com/ at the time of purchase will apply to the purchase of this product. 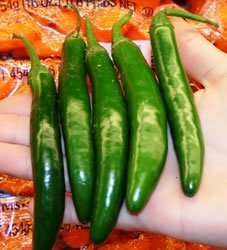 Serrano Hot Peppers are very hot in flavor and can be eaten green or red. This pepper is perfect for salsa, picante or chili sauce. Plants get 30" tall and are very prolific; pepper grows 2" inches long. They do not need to be steamed or peeled before using because of their thin walls. They turn green in color at first, and then ripen to red, brown, orange, or yellow. Serrano hot peppers don't dry well, since they are too meaty. The Serrano is said to be about 5 times hotter than the jalapeño. Seeds should be started indoors 8 to10 weeks before the last frost. When the temperature reaches 70° F., transplant 12 to 16 inches apart, fertilize, and again when they are 12 inches tall.